The Magical Optimism From The Asylum Room. Probably the most famous painting created by Vincent Van Gogh, The Starry Night is a dimmed view from the window of his asylum room. Due to the consistent emotional torment from people, Van Gogh checked himself into Saint-Paul Asylum, where nature brought him inspiration to create again. The Starry Night Not A Failure. How lucky we are that Vincent did not destroy this altruistic creation. Even though Vincent Van Gogh was self deprecating about this piece, he created many sketches to carve out a general plan. While this painting depicts a seemingly tranquil night, everything from top to bottom pulsates with brim energy. An incredible effect of the circular wind, combined with the general ascension from lower left to right, makes this a geometrical masterpiece. The artistic and intellectual element, though, is not forgotten. Death to reach the star. While most people focus on the stars that are ever so bright, the cypress tree seems to make the biggest impression on me. 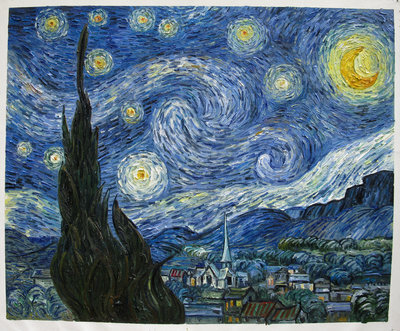 Without an understanding of their symbolic importance, one will never see the true magic in the Starry Night. The cypress tree is commonly associated with death. At first glance, these trees look like a smoky, burned fire ready to ravage a town.